Following Saturday's announcement that sanctions against Iran are being lifted, tensions are continuing to increase between Iran and Saudi Arabia. Tensions turned to hostility earlier this month when Saudi Arabia executed 47 alleged terrorists -- 46 Sunnis and one Shia, Mohammad Baqir Nimr al-Nimr, infuriating Iran and Shias because it implied that Shia terrorism is equivalent to Sunni terrorism. Iranian mobs firebombed the Saudi embassy in Tehran, and attacked the consulate in Meshaad. This led to the severance of multiple diplomatic and commercial ties between Iran and several Saudi allies. With sanctions lifted, Iran is now expected to flood the already flooded markets with additional oil. With the price of oil now well below $30 per barrel, Iran and Saudi Arabia are accusing each other of trying to damage the oil-producing nations. Pakistan's Prime Minister Nawaz Sharif and Chief of Army Staff (COAS) General Raheel Sharif will visit Saudi Arabia on Monday and Iran on Tuesday on a "peace mission" to "normalize" strained relations between the two countries. "Pakistan is deeply concerned at the recent escalation of tensions between the Kingdom of Saudi Arabia and the Islamic Republic of Iran. ... The purpose of the visit is to mediate and to end the standoff between the two countries." Pakistan is a mostly Sunni Muslim country with very close ties to Saudi Arabia, including mutual promises of military support when needed. Pakistan is also thought to have promised the Saudis to provide them with nuclear technology to match Iran's nuclear technology. This would seem to mean that Pakistan's one-sided alliance makes them an unlikely mediator. However, Pakistan can point to the fact that it's refused to provide military support to the Saudis in their proxy war with Iran in Yemen. Pakistan has diplomatically supported the Saudis in that war, but when called upon by the Saudis to provide troops, they refused, angering the Saudis. "Our policy is clear. We will stay neutral in the heightening tension between the two Muslim states. Although we condemn Iranian interference in the internal affairs of Saudi Arabia, including its reaction to Sheikh [Nimr Baqir] al-Nimr's execution, still we will not be part of any military offensive against any country in the region." Two days ago, we wrote about the trending Mideast alignments, with "the two main world powers, America and Russia, tilting towards the Shiite bloc of Iran, Iraq, Syria and Hezbollah versus the Saudi-led lineup of the United Arab Emirates, Egypt, Turkey and Pakistan," which is the alignment that Generational Dynamics has been predicting for years. I suggested that any analyst, politician, army general, or college professor whose job depends on knowing what's going on in the world would do well to study generational theory. 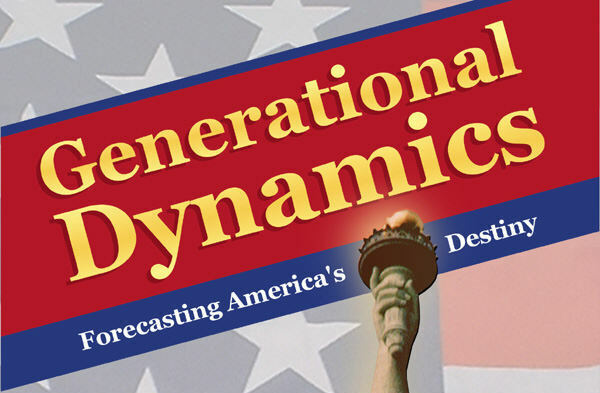 Question: You've said that Generational Dynamics has been predicting for years that Iran would become an ally of the United States. Now that it's happening, it appears to be Obama's doing. Would there have been a nuclear deal if Mitt Romney had been elected president in 2012? Iran's rapprochement with the West is not coming from Obama, but from the Iranian people themselves. In the article "9-Nov-15 World View -- Political crisis in Iran grows over nuclear agreement", I included in some excerpts from articles in the early 2000s that I had saved in my archive. The articles described large pro-Western protests by college students who had grown up after the 1979 Great Islamic Revolution. The news stories described how Iran's security forces used violence to crush the protests. Today, the college students in that generation are now 30-40 years old, and have moved into positions of power. As they've grown up, they did not change their minds and adopted the harsh hardline views of the old geezers who survived the 1979 revolution. Instead, they're tired of being told what to do by the revolution survivors, and they want to rejoin the modern world. Those are the ones that bringing about Iran's rapprochement with the West. So if Romney were president, the same kind of thing would have happened, though of course with a different scenario. For example, it might have been a kind of "President Richard Nixon goes to China" thing, where the news reports at the time in the early 1970s said that only a Republican could have gone to China because Americans would have protested too much if a Democrat had tried it. Well, in this case it's Obama who "went to Iran," and there have been a lot of protests, but if Romney were president, he too would not have missed the opportunity for rapprochement with Iran, just as Nixon did with China. Question: What about Europe? Will all the European countries align with the U.S.? The European Union is facing two major existential crises. One is the financial crisis, which has raged for years, especially in Greece, but is currently in remission. The other is the flood of migrants and refugees coming from Asia, the Mideast and northern Africa, numbering in the millions. This is ongoing, and will almost certain surge again when the weather improves in the Spring. These two crises have exposed fault lines in Europe, even to the point where border controls are being reimposed. But no fault lines have so far risen to so high a level that war is threatened. If we look at history, there's been a great deal of animosity between England and France, with many examples since 1066. But Britain and France were allies against Germany in World War II. Another issue is the role of Turkey and Russia in Europe. In WW I, Turkey was allied with Germany while Russia was allied with France. Today, the hostility between Turkey and Russia is palpable, and they'll certainly be fighting each other, as they have many times the in past centuries. So does that mean that Germany and France will follow Turkey and Russia, and be at war with each other? It doesn't seem plausible today, but stranger things have happened. This question could be answered in greater detail with resources beyond what are available to me. This would involve, for example, research to determine changes in attitudes of the people of each European country, on a month to month basis, to see how they're trending, and how people are responding to various events. Question: How does Generational Dynamics interpret the rising tide of anti-immigration parties springing up in Europe? It seems that the people are starting to resist, just like here. I've written about this subject before -- the general rise of nationalism and xenophobia around the world in this generational Crisis era. The survivors of World War II saw that much of what happened had its roots in the same kind of nationalism and xenophobia, and decided that it must never happen again. The whole "European project" that led to the formation of the European Union was exactly for that purpose. But it didn't work, because now the same nationalism and xenophobia are growing again anyway. The recent reported incidents of alleged sexual assaults by Muslim migrants are particularly explosive, and may motivate further violence. In yesterday's story about the Taiwan election, I included news about a 16 year old girl was forced to apologize for waving a Taiwanese flag. The forced apology infuriated the Taiwanese people, and appears to have influenced the election in favor of Taiwanese independence. This is an example of how an incident can incite a mob to vote a certain way. During a generational Crisis era, once the scene has been set with two ethnic or religious groups becoming increasingly belligerent towards each other, and start blaming each other for the world's problems, any sort of crisis could mobilize mobs of people to violence. We've seen intermittent examples of this in countries like Egypt and Burma, as well a several countries in the Mideast. Throughout history, major wars often began with exactly these kinds of increasing mob violence.